Remove batteries from the smoke detector because they are hazardous waste. Then dispose of the smoke detector separately. Find out how to dispose of batteries. Ionization smoke detectors emit small amounts of radioactive material, and can be identified by their warning labels. Return these to the manufacturer by mail. Find out from the US Postal Service how to return these detectors. Photoelectric detectors will not have a warning label, so dispose of these detectors as e-waste. 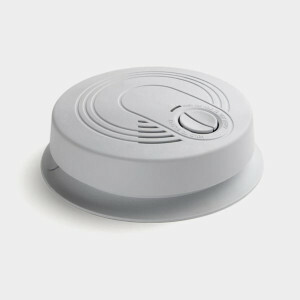 Smoke detectors sense smoke and flame differently, which give them their own advantages. The U.S. Fire Administration recommends that you have one of each type at your home. Ionization smoke detectors are the type that sense a fast-moving, flaming fire more quickly, while photoelectric detectors are more sensitive to slow, smoky fire.